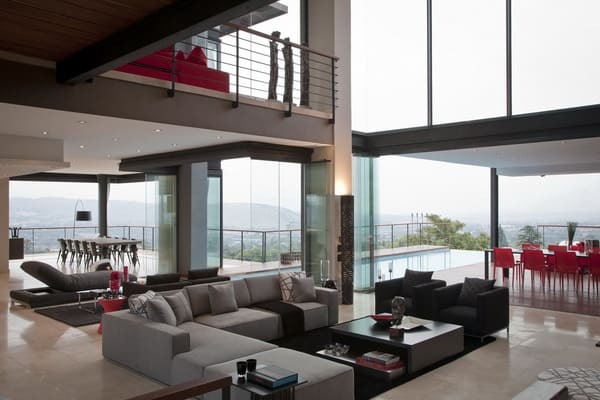 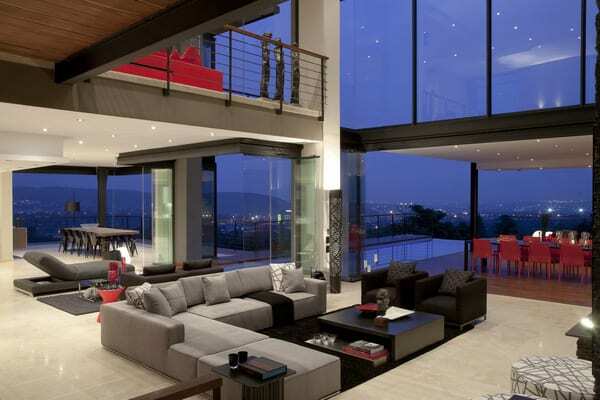 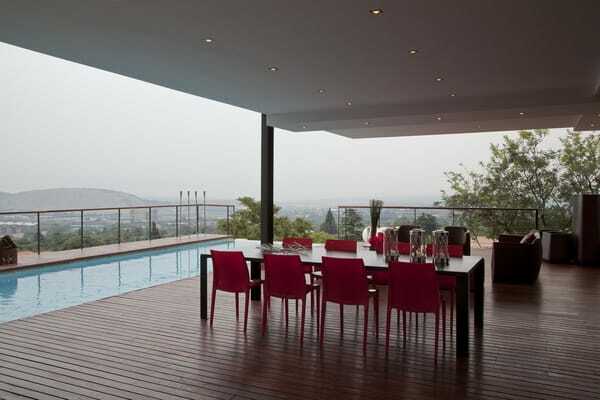 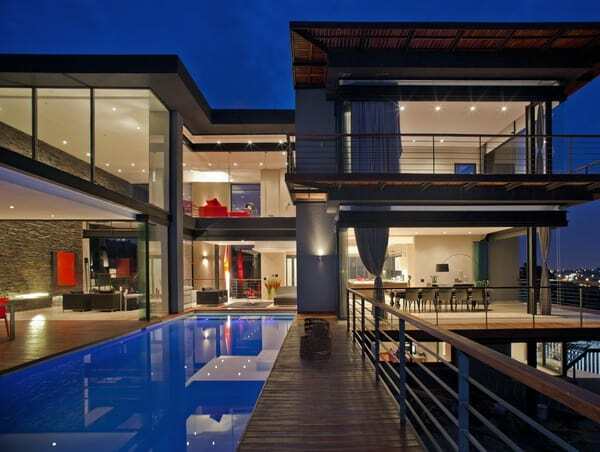 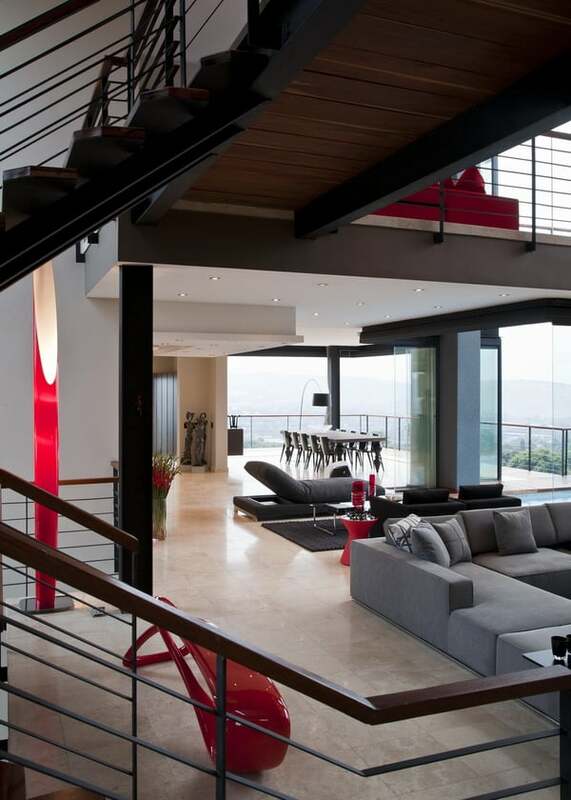 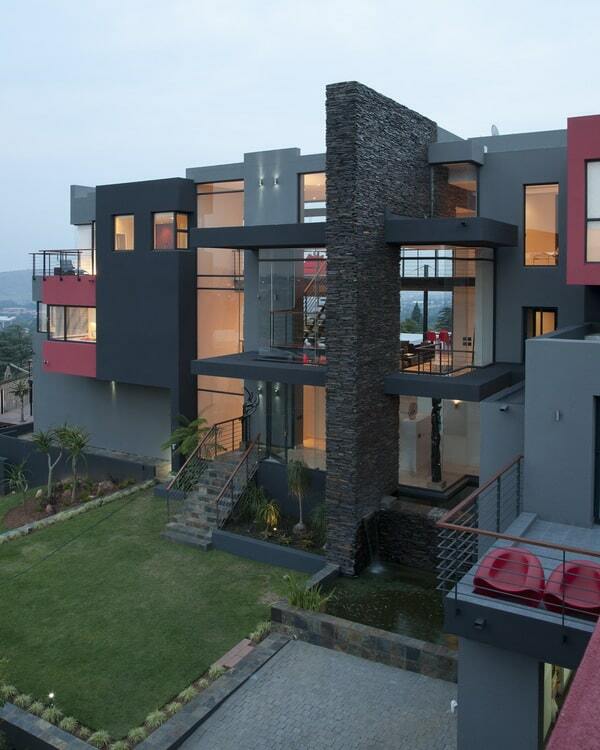 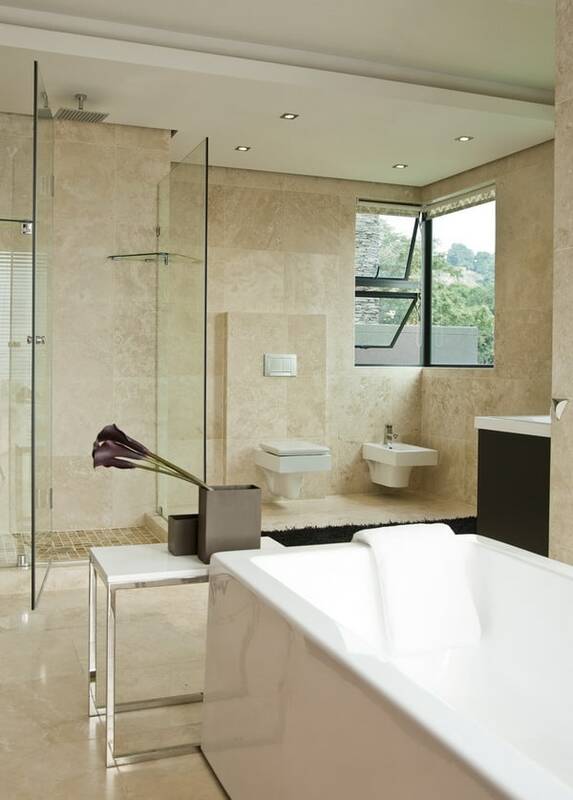 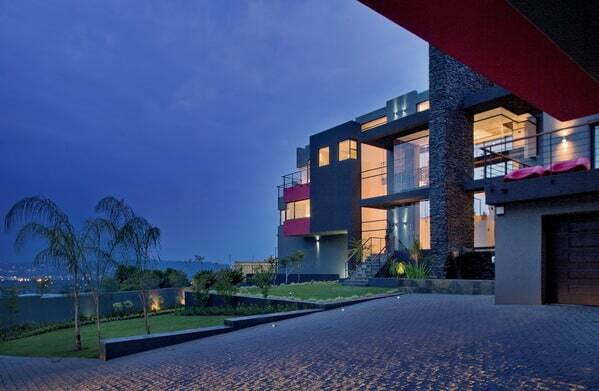 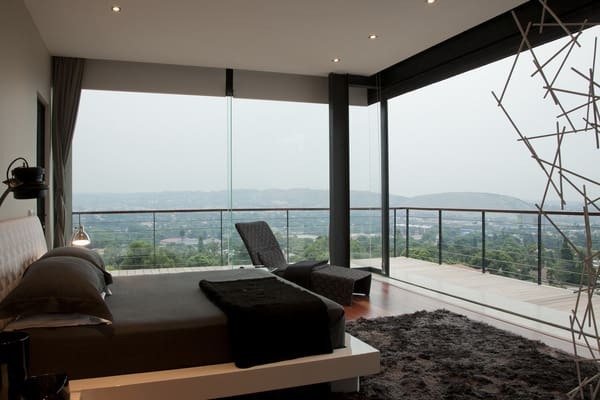 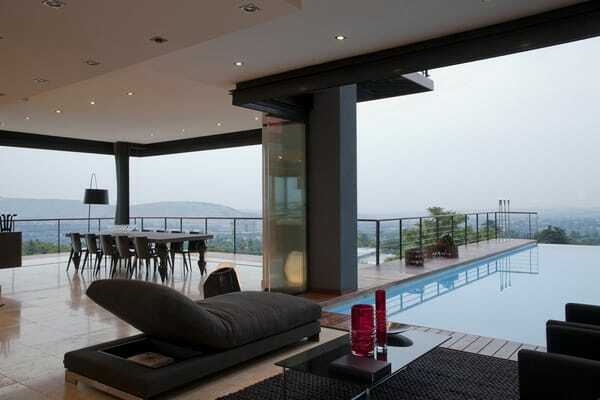 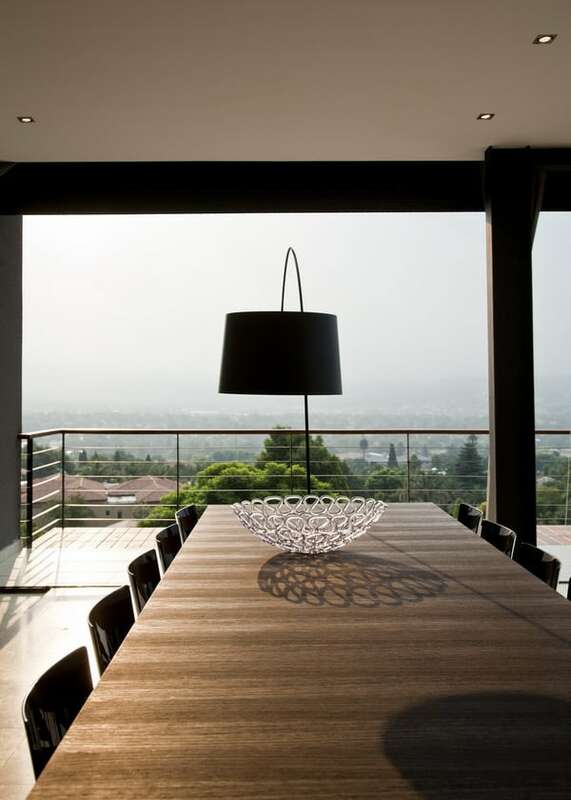 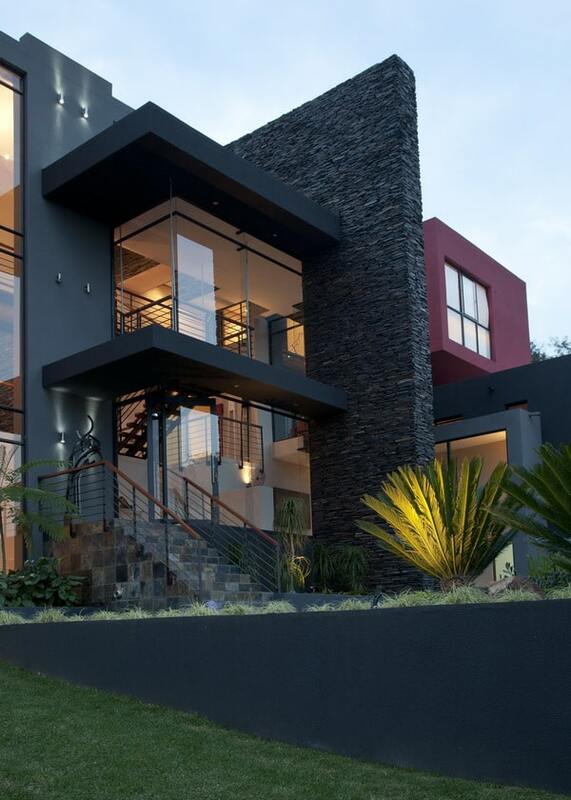 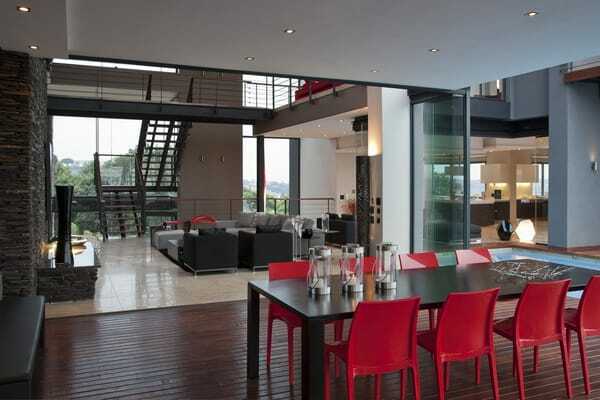 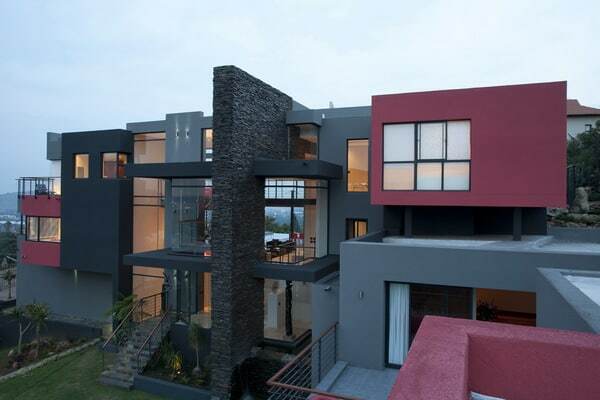 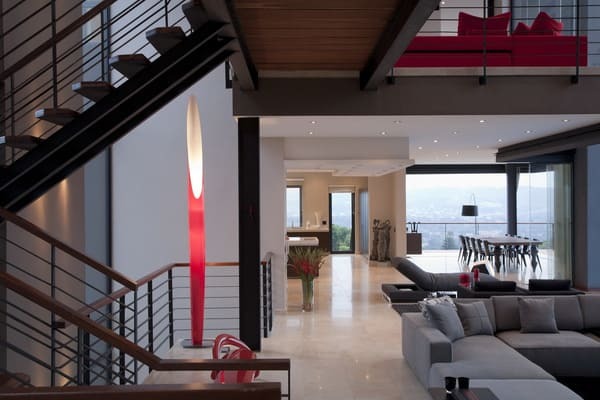 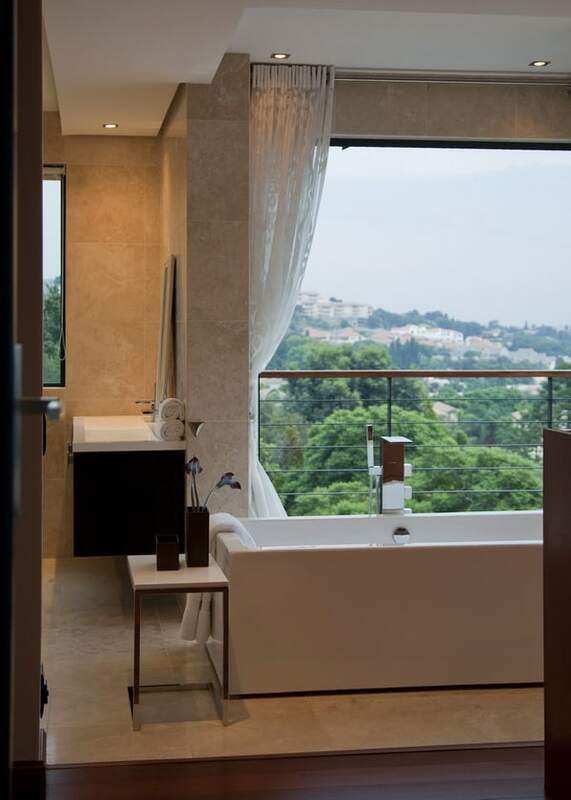 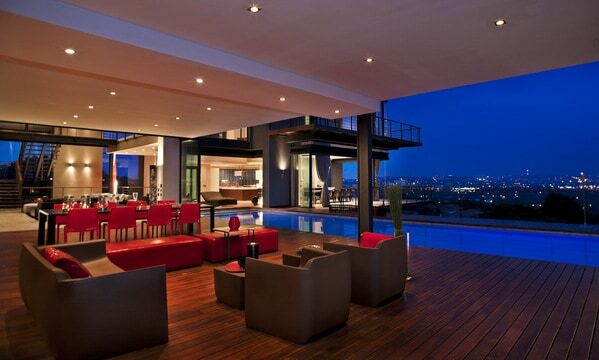 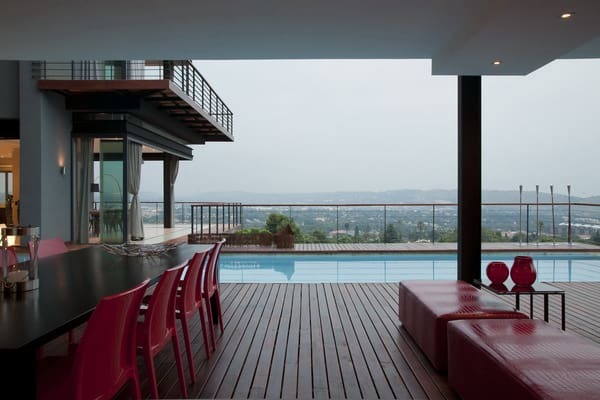 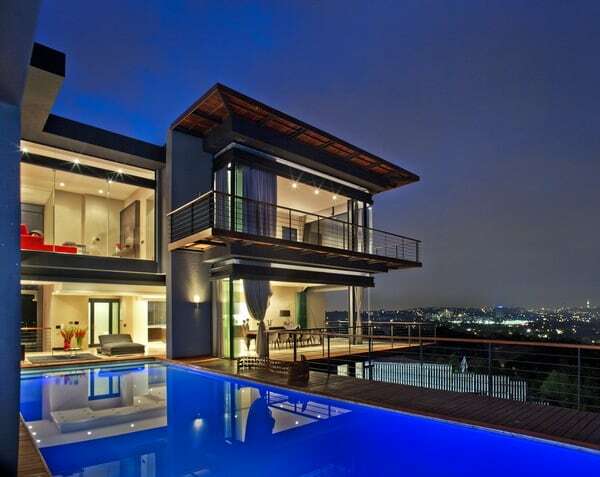 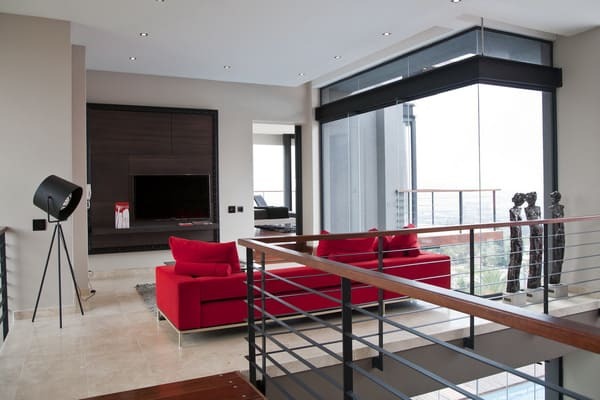 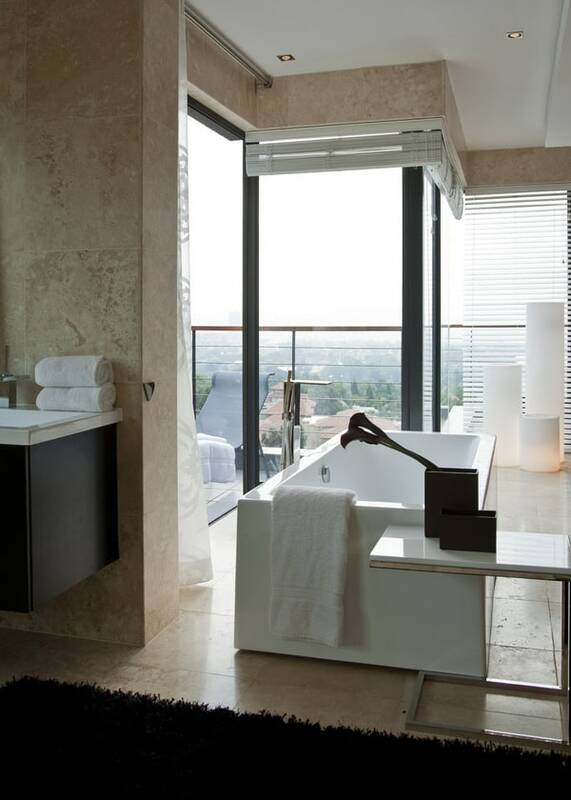 This is a redesign and renovation of 1950’s house on a hill overlooking Johannesburg by Nico van der Meulen Architects. 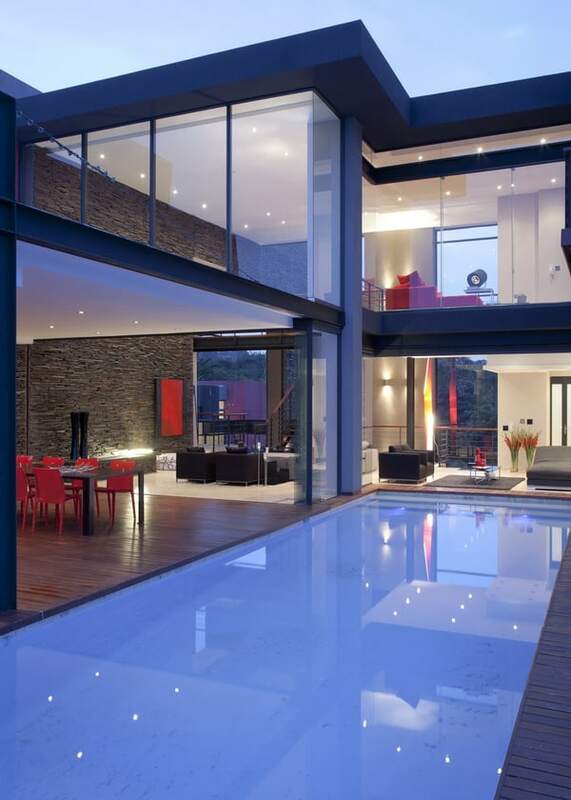 This stunning home is situated in Bedfordview, a suburb of Johannesburg, South Africa, with interior design by M Square Lifestyle Design. 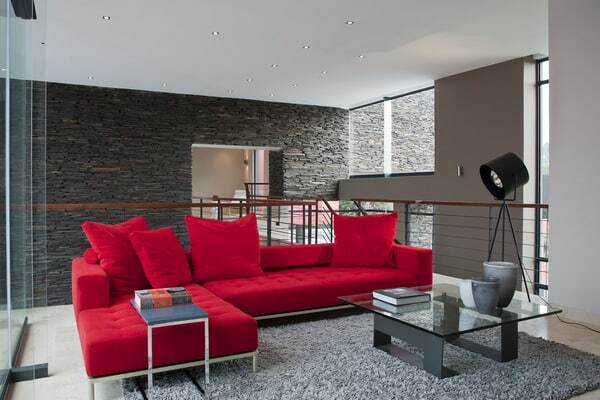 Most of the furniture was supplied by M Square Lifestyle Necessities. 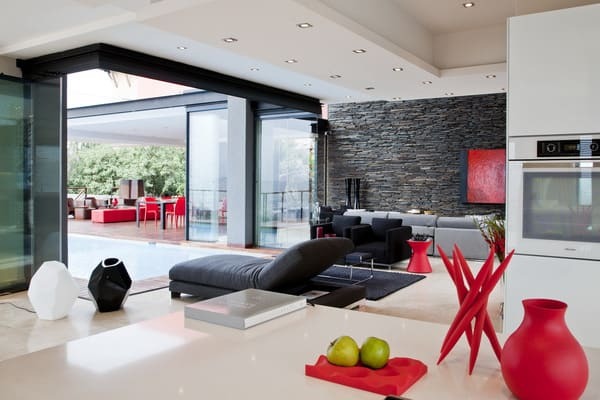 Little was added to the footprint of the existing house (except for the new garages), but almost all of the internal walls were removed to create the open plan layout and maximize the views. 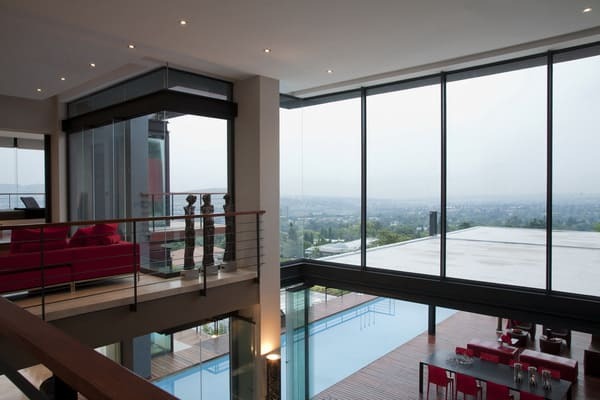 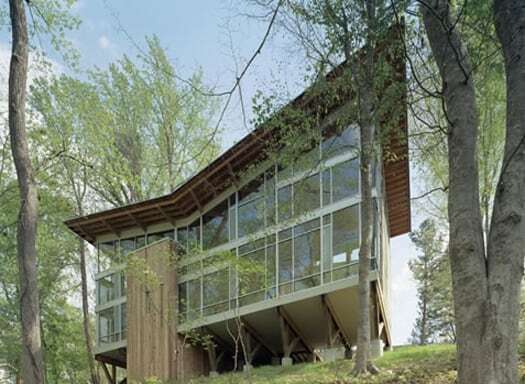 The 270 degree view can be enjoyed from just about every room in the house. 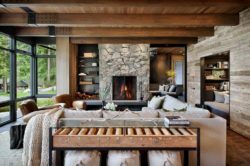 Frameless sliding/folding doors were used around the living area, enabling the area to function like a veranda during the mild days experienced almost year round. 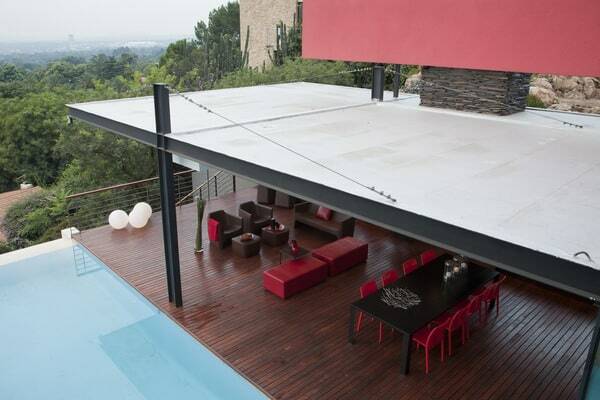 The pool infinity edge is cantilevered out nearly six meters, supported on a column and protrudes into the house when the doors are open, acting as a temperature stabilizer. 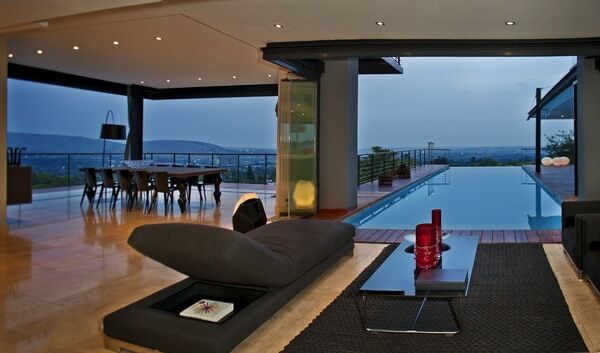 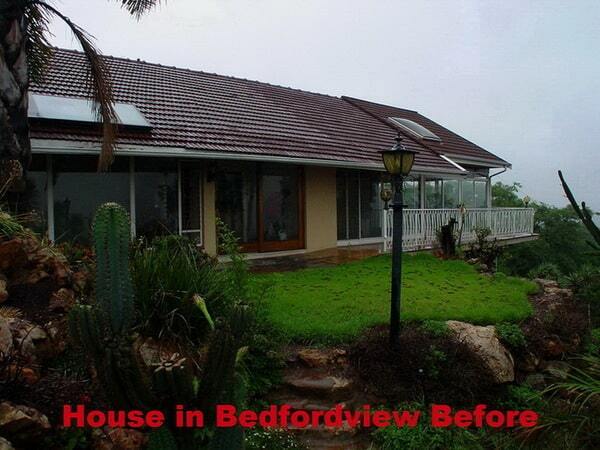 The original cellar was retained as a wine cellar and a home theatre with views into the pool. 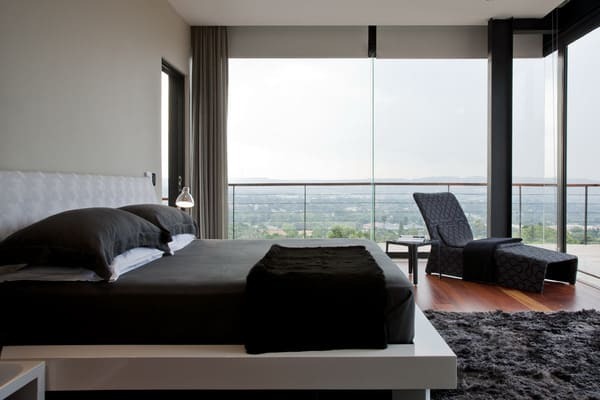 A story was added containing the main suite, pajama lounge, kid’s study area and kid’s bedrooms. 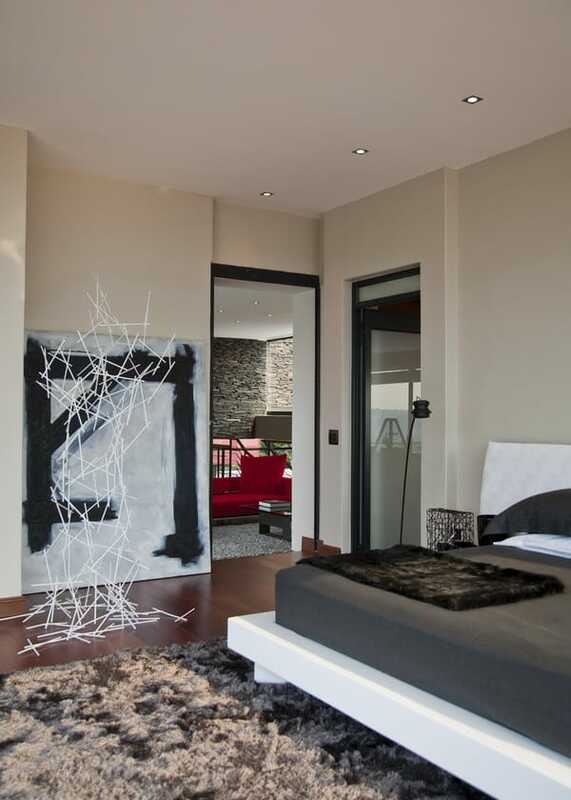 The original two kid’s bedrooms became a study, and the original main suite a guest suite. 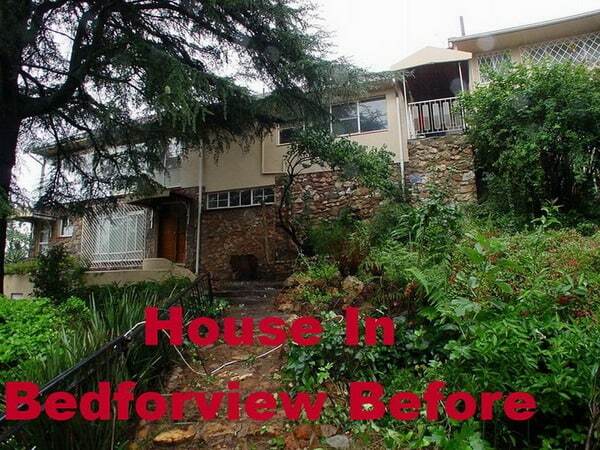 Extra garages were needed and the housekeeper’s cottage was built on this. 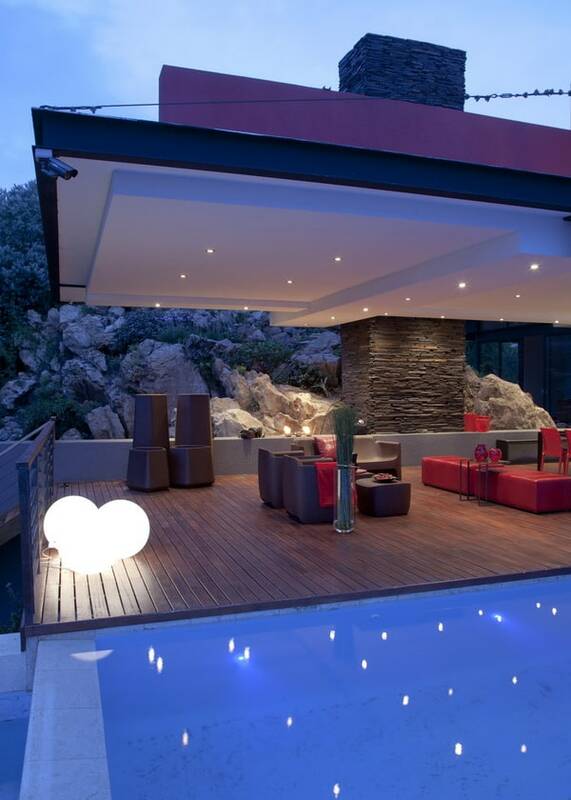 The original balcony is still visible in the next photograph, the new lanai and pool were built where the small lawn used to be. 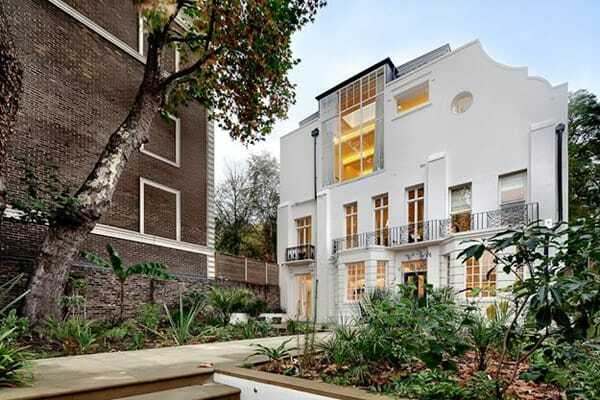 The original house was north-facing, but on an extremely limited level platform: The site has a five story fall from the south-east to the north- west corner. 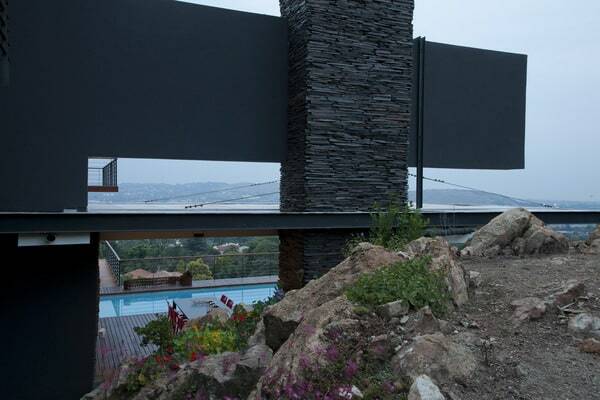 Werner van der Meulen designed the infinity edge pool to extend over the steep fall, placing it on a single 3m diameter column, cantilevering nearly six meters. 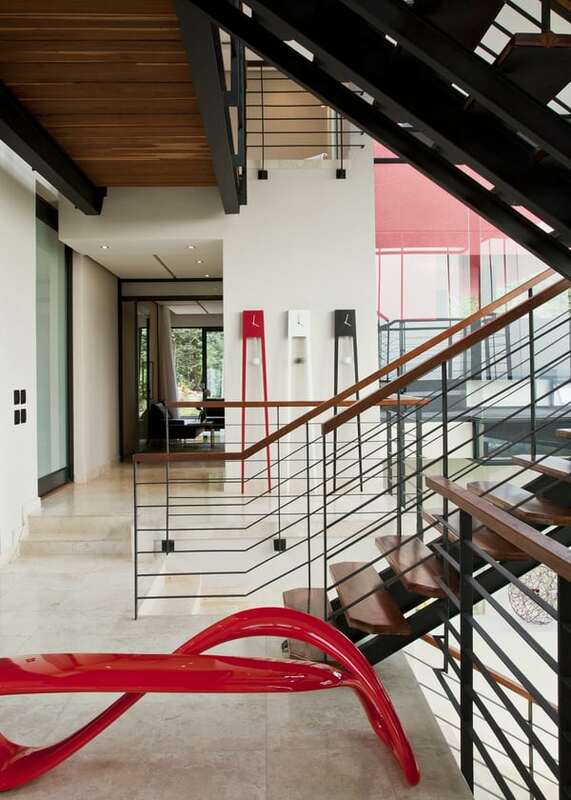 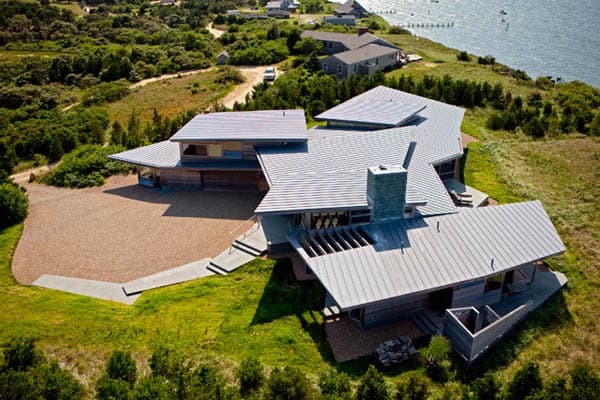 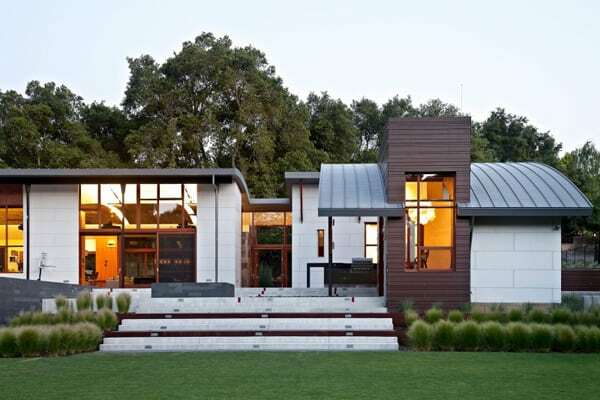 He created a massive rock clad wall which bisects the building on a north-south axis, then transforms into a huge red-painted beam which helps to support the lanai roof. 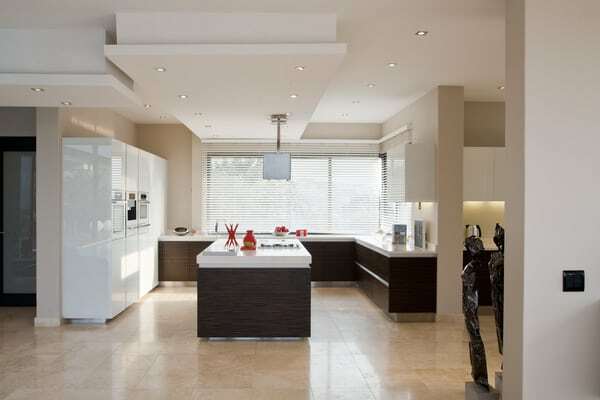 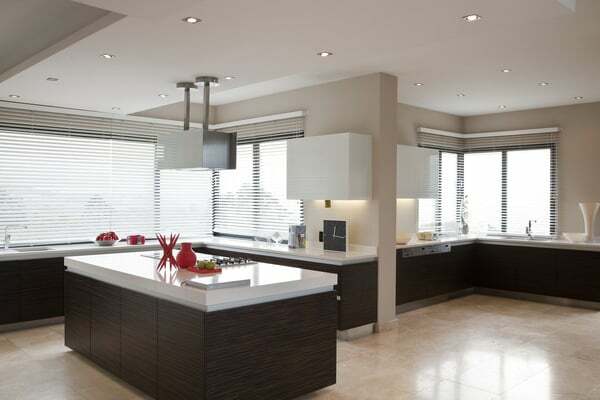 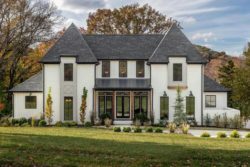 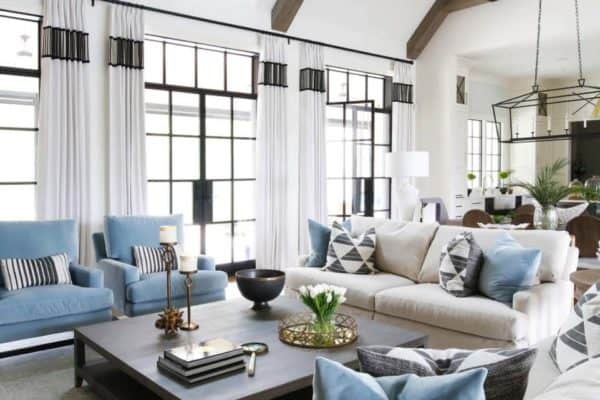 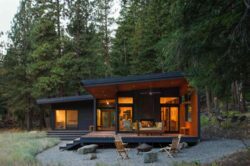 The ground floor living space was gutted, and a large open plan, partially double volume living space housing the family room, dining room, kitchen and ancillary spaces created. 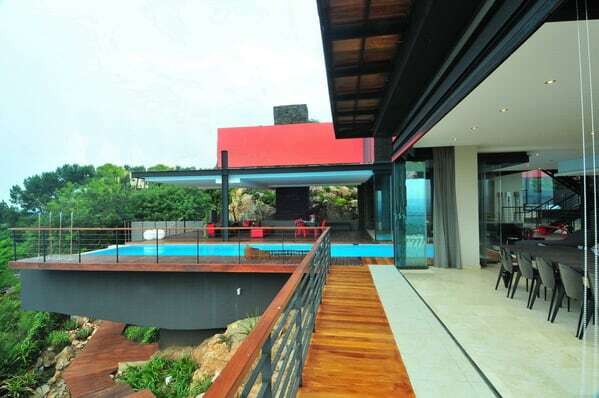 A new 6×13 meters lanai next to the pool was added on the only piece of usable land on the north side, growing out of the mountain, with spectacular views to the north and west.